Last week was a crazy week in the Pogue house. It seemed like every night we had something going on, and the weekend was shaping up to be pretty busy as well. That is when I decided I wanted dinner on Friday night to be something extra special for Studhubs. I had some time on my hands that day, and that meant I could make something slow cooking, rich, and hearty. 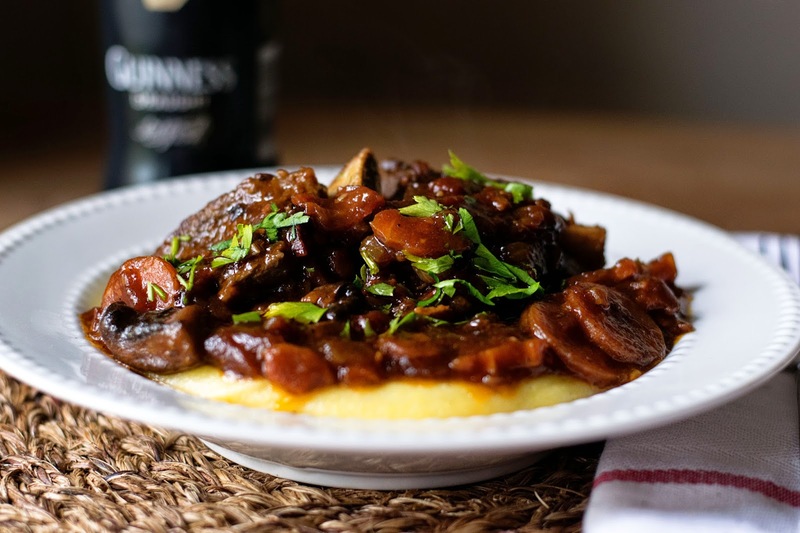 The first thing that came to mind were these DECADENT Guinness Braised Short Ribs over Polenta. Because let's face it, when you think of something special for the man in your life does it get more manlier than beef and beer? I think not. So that is what I did and can I just say that they were AMAZING! I know you are going to love them, and I can't wait to share with you how I made it! Since this is a slow cooking recipe, I like to have as much of the work done ahead of time as possible. Go ahead and dice the onion, slice the carrots, wipe-off and quarter the mushrooms, slice the bacon, and finally, slice the garlic. Next, pat the short ribs dry with a paper towel. This will give them a little time to marinate in that seasoning while you work on other things. Now it is time to get this party started! Place your Dutch oven or heavy pot on the stove and add the oil and bacon. Then turn on a medium/high heat and let to bacon render it's fat and be come crisp. This will take about 8-10 minutes. When your bacon is browned and crisp, remove it from the pot with a slotted spoon and place on a paper towel. Now you can add the short ribs in a single layer to the pan. Brown for 2-3 minutes on each side. Once they have been browned on all sides, remove from the pot and set to the side. To the pot, you can now add the carrots, onion, and mushrooms. Let them cook for about 7-10 minutes until the carrots are tender and the onions are soft and translucent. Pepper to the vegetables once they have cooked. Let the garlic cook just long enough so that you smell it coming from the pan. Bring the sauce to a low simmer. Return the ribs to the pot, cover, and let cook for 3 hours. Make sure you are checking on them about ever 30 minutes. If it seems that the liquid is evaporating too much, just add a little water. After 3 hours the short ribs will be fall off the the bone tender. Remove them from the pot and set to the side. Mix it up and pour into the sauce. This will help it thicken. Once the sauce has thickened you can return the ribs to it. And there you have it! The ribs are ready to serve! Look at that! Rich, hearty, beefy. Oh.So.Good. I like to serve this over a bed of polenta, but you can also serve it over mashed potatoes if polenta isn't your thing. This meal, it is divine. I know it will warm the heart of any beef loving human being on the planet, so the next time you have a little extra time on your hands and want to make something special for your loved ones, get in the kitchen and give this a try! Place a heavy pot over medium/high heat. Add the olive oil and bacon. Let the bacon cook until crisp, about 8-10 minutes. While the bacon is cooking, pat the short ribs dry and season them liberally with salt and pepper. Once the bacon has crisped, remove it from the pan and add the short ribs. Brown the short ribs on all sides, about 2-3 minutes per side. Once browned remove from the pot and place on a plate to the side. To the pot and the drippings add the carrots, onions, mushrooms, and garlic. Cook for 5-7 minutes until tender. Next add the diced tomatoes, bacon bits, beer, bay leaves, honey, and salt and pepper. Bring to a low simmer, cover, and let cook for 2 and a half to 3 hours. After 3 hours, remove the short ribs from the pot and combine the cornstarch and water to make a slurry. Add to the sauce and let it simmer until it thickens. 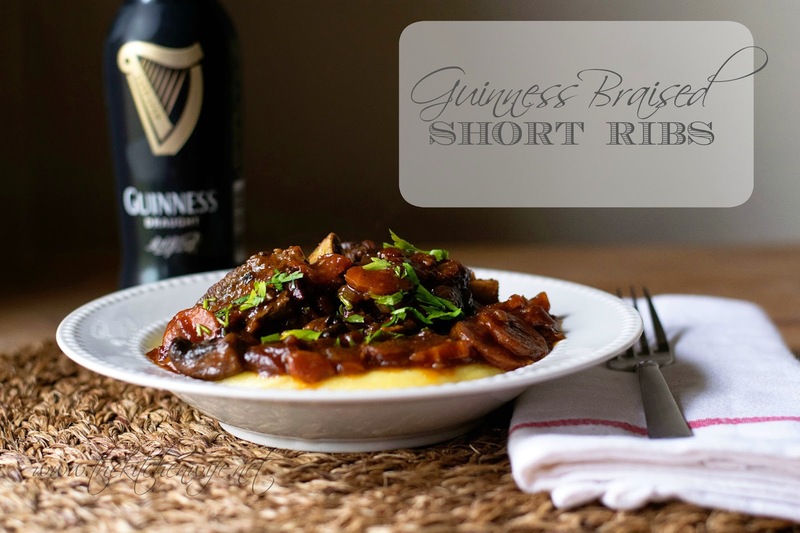 Serve the short ribs and sauce over a bed of polenta or mashed potatoes.